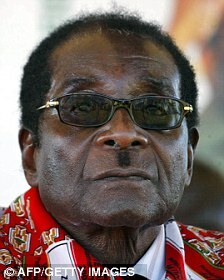 Robert Mugabe is the 92-year-old president of Zimbabwe, Africa. He has held high office in that country since elected as prime minister in 1980. His history as a Zimbabwean revolutionary included the "ethnic cleansing" of over 20,000 members of the Ndebele tribe between 1982 and 1985. In spite of his terrible deeds, Mugabe is generally considered a hero among the people of Zimbabwe. This is because he fought in the Rhodesian Bush War against the conservative white minority government in Rhodesia. He was captured and held as a political prisoner in Rhodesia for over 10 years. He was elected to be Zimbabwe’s Prime Minister in 1980 after helping win his country’s independence. Once in office, Mugabe established a one-party state run by his political party, the Zanu-PF. He used the Fifth Brigade, a North Korean trained security force to attack and murder "internal dissidents, thus crushing an armed rebellion by Joshua Nkomo, leader of the Ndebele tribe. It is said that at least 20,000 bodies are buried in a shallow grave following that conflict. The Zimbabwe parliament declared Mugabe executive president in December, 1987, and gave him total executive powers as head of state, head of government, and commander-in-chief of the armed forces. He also was given powers to dissolve parliament and declare martial law. He remains in total power over Zimbabwe to this day. He has declared his plan to run for re-election in 2018. But there is unrest in Zimbabwe these days and opposition parties are lurking in the shadows. Mugabe managed to stop street protests when he placed a two-week ban on all public protest demonstrations. As he still rules with an iron fist, the protests were temporarily halted. But there is deepening factionalism. Many are wondering who or what kind of government will succeed this aging dictator.